Thank you for paying your Annual Scout Dues!! If you are an existing member of Pack 99, then you are all set for the year. 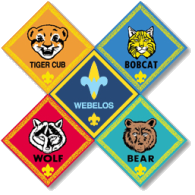 If you are a new member of Pack 99, please complete the BSA Youth Application. Hand in the completed form and your PayPal receipt to a Adult Leader at the next pack event or den meeting. Sorry for the extra paper work, but BSA is still in the stone age.